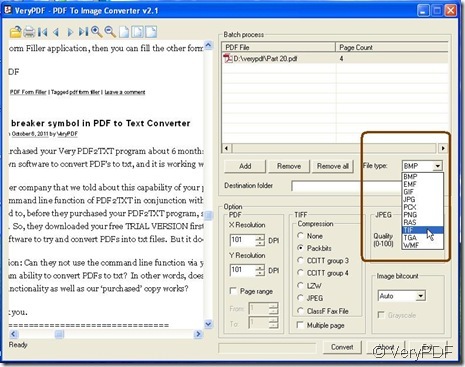 ← In the docPrint Document Converter application, how can I combine DOC, DOCX, PPT, PPTX, XLS, XLSX, HTML, etc. 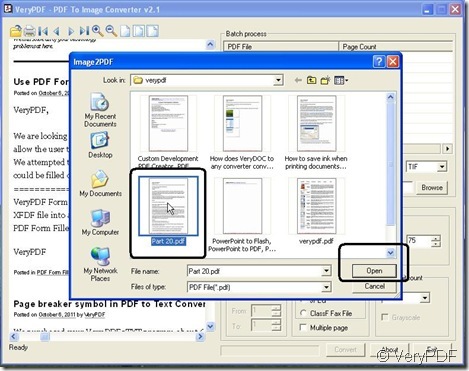 various formats into one PDF file? 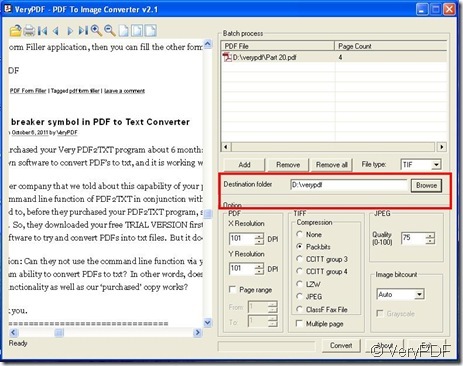 What could help us convert PDF to TIFF image? 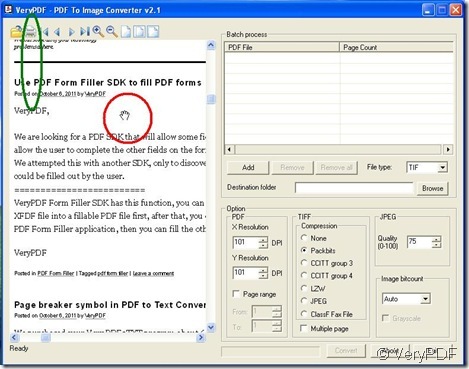 PDF To Image Converter v2.1 will help you with converting pdf file to tiff image easily as you wish. 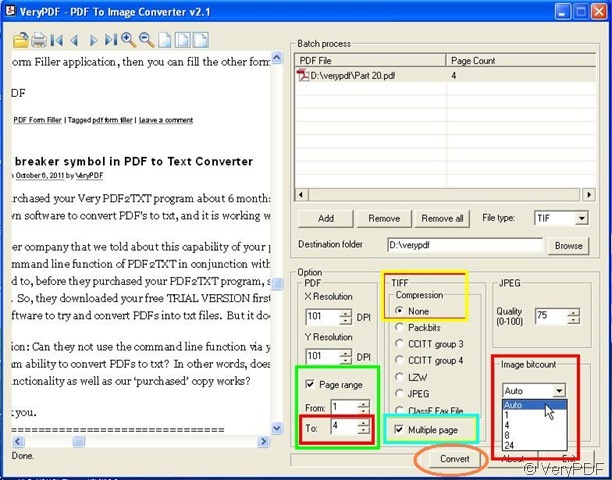 PDF To Image Converter is an application program based on Windows platform, which can directly convert PDF files to kinds of image formats, such as TIFF, JPG, GIF, PNG, BMP, EMF, PCX, TGA etc.. 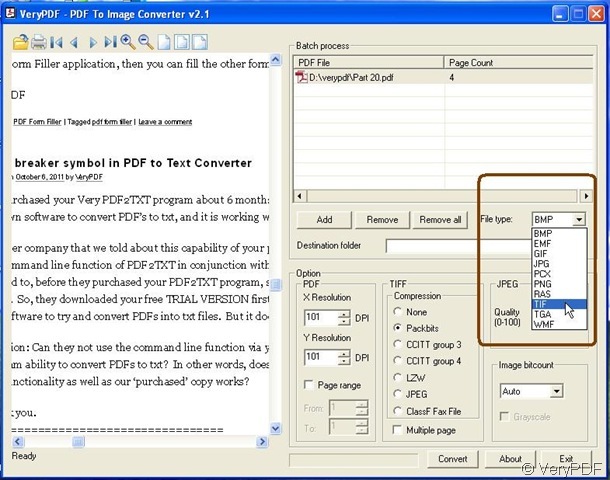 If you would like to try PDF To Image Converter v2.1, here is another link for you to get a trial version: http://www.verypdf.com/pdf2tif/pdf2image.exe. 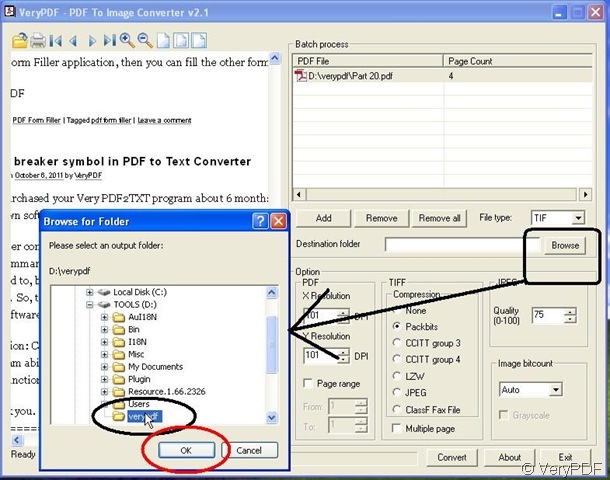 Download PDF To Image Converter v2.1 here and experience it with your unimportant file for there will be a watermark on your file after you convert it in PDF To Image Converter v2.1. 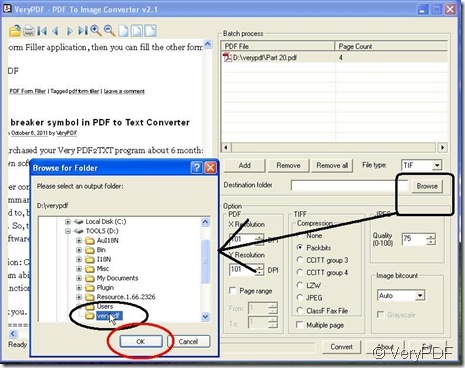 How can we convert pdf file to tiff image in PDF To Image Converter v2.1? First we should know some information on TIFF image format briefly. TIFF is short for Tagged Image File Format, a variable-resolution bitmapped image format developed by Aldus in 1986. The TIFF format is widely supported by image-manipulation applications, by publishing and page layout applications, by scanning, faxing, word processing, optical character recognition and other applications.Adobe Systems, which acquired Aldus, now holds the copyright to the TIFF specification. TIFF has not had a major update since 1992, though several Aldus/Adobe technical notes have been published with minor extensions to the format, and several specifications, including TIFF/EP (ISO 12234-2), TIFF/IT (ISO 12639),TIFF-F and TIFF-FX have been based on the TIFF 6.0 specification. TIFF Class F. Class-F is the TIFF extension for fax documents. TIFF CCITT Group 3 is more advanced and more compressed than TIFF CCITT. CCITT Group 3--Dimensional Modified Huffman RLE. PackBits compression - a form of run-length ecoding. Also you can move your mouse onto your preview area when there will be a hand tool on it like the following red loop, then keep clicking your left button without pressing up on your mouse to move your mouse, your preview pdf will be moved together. 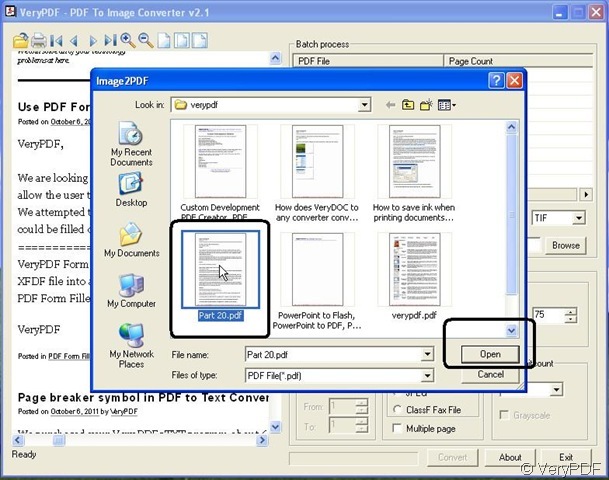 In the green loop, it is a printing icon, which is used for printing when you need. 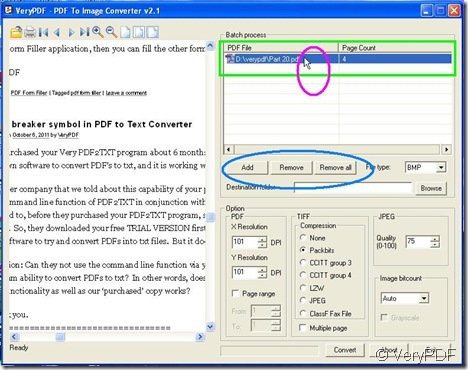 In the blue loop, you can press down “Add” button to add another route like this, which is located in the green loop in the figure above; You can use “Remove” or “Remove all” button to delete your pdf or delete all your pdf files one time quickly after you click your route that just appeared like the meaning that purple and green loops show us. 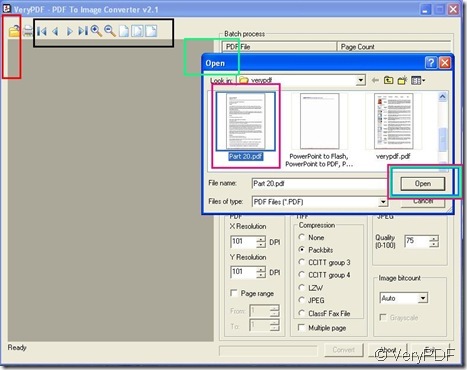 In “Page Count” subject, you can understand there are 4 pages from your pdf file, you have to activate “Page range” option, then you will get “From” and “To” active, too, keep the value in “From” as “1” still and change the value in “To” as “4” or the one greater than 4. 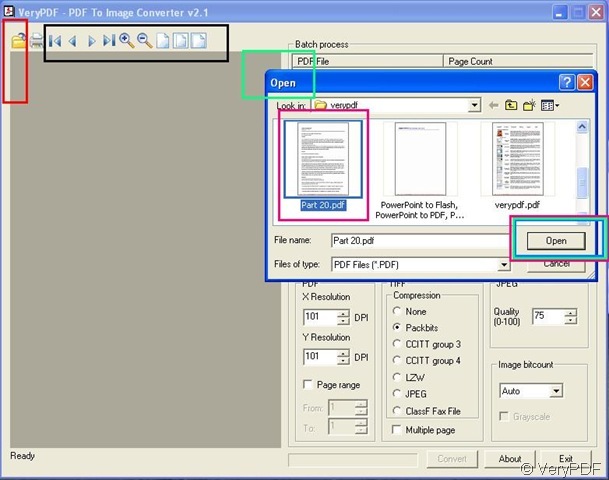 Here is a rule, which is that keep the value in “To” equal or larger than the greatest number in the “Page Count” column when there are lots of pdf files to get all images without missing.Also you just do not click the “Page range” button to get all images converted from pdf file too. If you want some segment pages of your pdf file converted, you just need to set your values in “From” and “To” as the range you want. 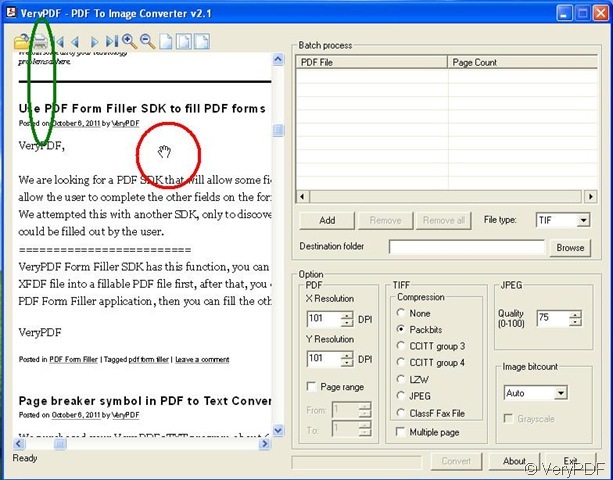 For example, when “From”=3, “To”=4, you will get the third image and the fourth image converted from pdf file here. 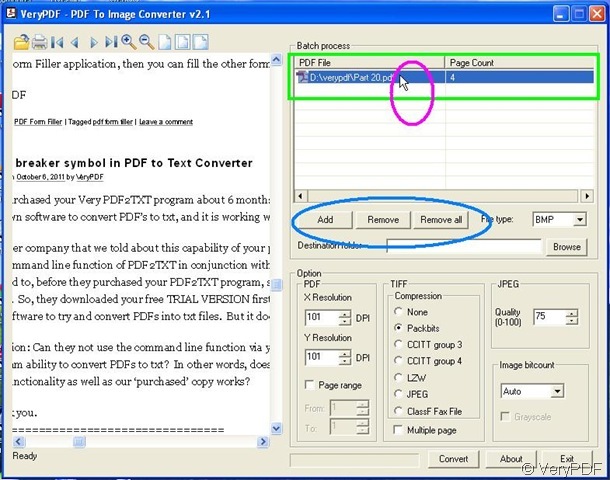 Click “Convert” button on the panel of PDF To Image Converter v2.1, then close PDF to Image Converter. 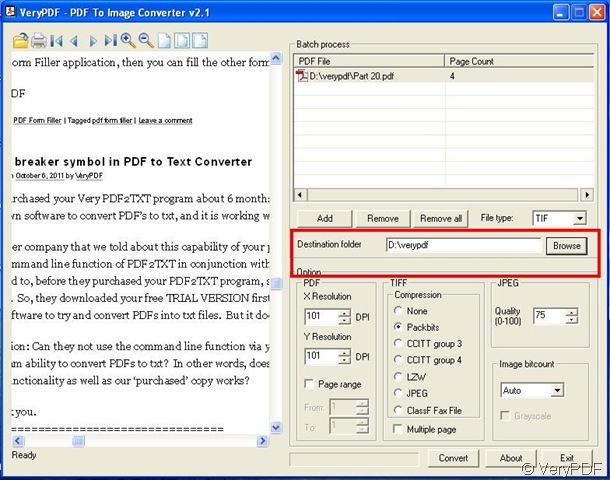 Which PDF to Image Converter is based on PDFToImageConverter2() function? 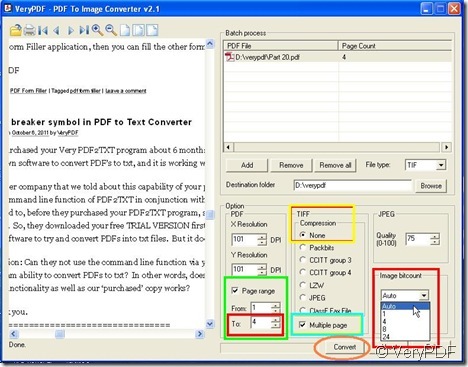 Convert Korean characters from PDF file to BMP image?